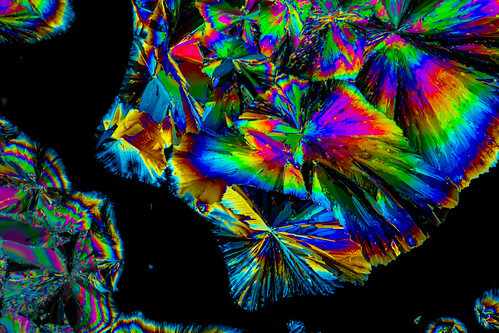 One of the crops taken from my 900+ megapixel photograph, this shows the phenomenal colors that can be present in the crystals of Citric acid after being dissolved in water! Anyone can try this at home, and you don't necessarily need pricey gear either. For the setup, I used 4X magnification and set up two circular polarizers at 90 degrees to each other, in a way that everything, including the filters and glass slide, could be more or less parallel with the camera's lens/sensor. If you don't have an SLR or mirrorless, try it with your own phone using a DIY phone microscope that can be found online, and is a very cost efficient method into beginners trying to go beyond 1:1 macro!